If our presentations don’t stand out, how can clients expect our designs to? I found the following video about Steve Jobs’ presentations to be quite good. Look! It’s a bird, It’s a plane! No, it’s a problem solver! Really? Is that all? Aaron, I didn’t mean that everything a client gives to me is a “problem” but it’s up to the designer to form a visual solution for them since a lot of time the client is not able to illustrate what they want. Like the first commenter, I view the role of a designer as a problem-solver. While I didn’t mean to say that as designers, we’re not problem-solvers, I do think that designers are more than problem-solvers – and therefore should be classified as such. “Problem-solver” is truly a large portion of our job description, and as I mentioned in my previous post, I also enjoy referring to myself as a “professional problem-solver.” But I do particularly like the different twist that Adrian Shaughnessy puts on “Problem Solving” in his book Graphic Design: A User’s Manual. Your presentation doesn’t necessarily have to be at the end of the design process. You are presenting yourself the entire time. The more persistent, communicative and trustworthy you are, the better chance you’ll have at winning that client for the long run. This is great insight. I also agree that the more honest and communicative you are with a client the whole way through, the better your working relationship will be in the long run – and it may even lead to new design work. Some clients I’ve worked with have been strictly through email. When I’ve won some design contests online, the clients I received lived in different countries than I do. Given our time differences, and the ease of communicating a lot of information at once, email was our preferred method of communication. Are Designers Merely “Professional Problem Solvers”? As designers we are always the problem-solver/ therapist to our clients. This is an interesting quote that brings up the idea of designers as problem-solvers and therapists to their clients. I personally have always loved describing myself as a “professional problem solver” and I love the satisfaction of being given a very difficult task, breaking it up into smaller pieces, and successfully “solving” my problem. It feels like the satisfaction of scaling a tall mountain to stand at the peak and breathe in the fresh mountain air. But is that really all we are as designers? This post explores the history of INDUSTRIAL SOCIETY (1830-1944), Victorian Design (1840-1900), and Civil War Posters (1861-1865) in order to create a modern representation of a Civil War poster, based on the sinking of the South Korean warship – the Cheonan – on March 26, 2010. Click here for a large image of the full poster from my Tumblr blog. On March 26, 2010, an explosion occurred on or near the Cheonan, a Pohang Class corvette.The ship had a crew of 104 men at the time of sinking, and a total of 58 crew were rescued. Another 46 crew were unaccounted for. The explosion occurred in or near the stern of the ship, which caused the ship to break into two five minutes after, sinking at 21:30 local time (12:30 UTC) about 1 nautical mile (1.9 km) off the south-west coast of Baengnyeong Island. After the explosion the captain of the Cheonan contacted the fleet headquarters to say: “We are being attacked by the enemy.” Initial reports suggested that the ship was hit by a North Korean torpedo, and that a South Korean vessel had returned fire. Early reports also suggested that South Korean Navy units shot at an unidentified ship heading towards North Korea. A defense official later said that this target may have been a flock of birds that were misidentified on radar. 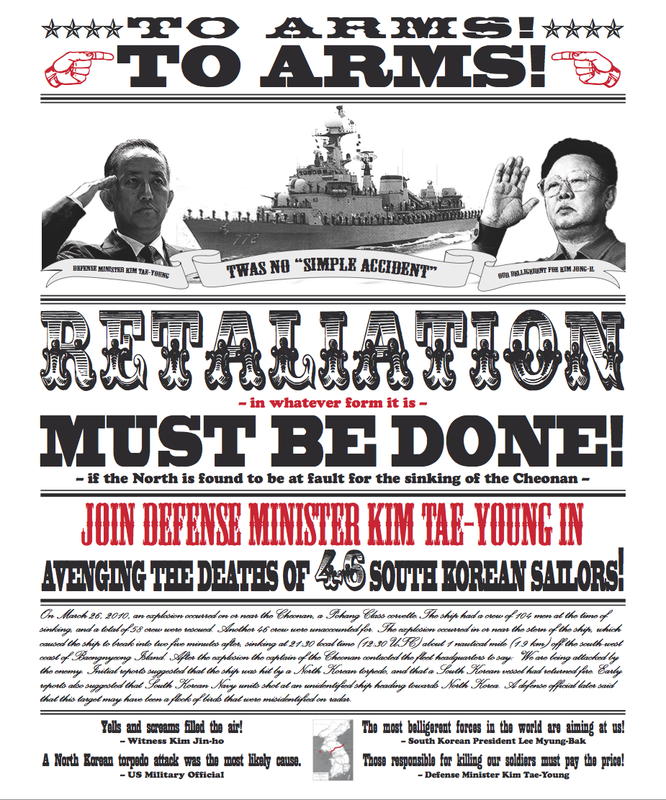 My goal with this poster design is to not only relate it to US Civil War posters, but also to depict the current mood surrounding this issue, and show the very emotional responses that some in upper-levels of the government and media have been giving (at least in Korea – though I heard Mrs. Clinton also recently took a very hard stance against North Korea). I want it to be clear that emotional responses, and angry retaliation without thinking through the consequences of what one says, or what one prints, should not be taken lightly, or acted upon rashly. War should never be a first response, or even a first consideration to any action, apart from an act of war itself. Since the sinking of the Cheonan in March, North Korea has denied all involvement in the incident (something, it seems, no one in the international community takes seriously), and has not responded or advanced militarily. These recent events have led the only divided country in the world into a tense “Cold War-like” state in which both are clearly upset at and fear the other, but neither wants to be the initiator of a certainly costly war. However, I still find the US Civil War to be an equally adequate reflection of the present state of affairs in Korea. The country is still technically at war, divided North and South for the past 50+ years, and the recent events could easily have led to (and may still lead to) a declaration of war (again), and recruitment poster. Therefore, led me outline the process of research and planning I went through to create this modern day Civil War poster for South Korea. Sometimes I wish media design was all about just “making things look pretty.” But most of the time, I’m glad there’s more to it. Although I find great stress relief in sitting down to organize colors and images on a page and create new pieces of work that express messages, I actually find more stress waiting for me if I’ve not first put in considerable time in planning and researching my subject first. After all, Adrian Shaughnessy writes that “in its purest sense, this is what graphic design is – a thorough interrogation of a subject resulting in a graphic presentation of the findings.” (Shaughnessy, 2009, p 7). Aaron I like what you said about reputations. It doesn’t matter who you are or what company you are you have a reputation, and it is up to you to make it good or bad….you can maintain a good reputation if you are open and honest with the client. Work in a cushion. It’s wise to build in a cushion for your deadline. To get a clear idea of how long a project will take, break it down into smaller pieces… And for each piece, add a small cushion to your time estimate. Then add up the time estimates of all the pieces, and you’ll have a cushion built in. This will allow for delays, and if you finish early, the client will be pleased. (Babauta, 2010). What I meant by “rituals” was basically “habits.” My waking up early every morning to work on my personal projects really has little symbolic value. The value I find in it is practical – it allows me to successfully knock out a large chunk of time on these projects early, when I have fresh energy and a clear mind. A habit of always beginning my day on time and on task helps me to accomplish far more than if I were to begin my day by planning when I would work. This is true. Setting up a plan or schedule is always much easier (and fun) than actually sticking to it. That’s why, as I illustrated in an earlier post, rituals – as the authors of The Power of Full Engagement put it – are incredibly important: “The sustaining power of rituals comes from the fact that they conserve energy.” (Loehr & Schwartz, 2003, p 169). If I have a task that needs to be completed and I stop to think about all the ins-and-outs of that task, I find that I waste much of my time and energy in thought and I don’t put forth my full force of effort and energy into the task at hand. Anyone who’s worked closely with supervisors on design projects – be they teachers, clients, or family members who ask for favors – surely understands the importance and value of deadlines. Since becoming a teacher myself, I’ve come to better understand how initial homework and assignments build upon each other to enable students to progress fluidly through a course up to the final test or project, while (mostly) retaining previously studied principles. Likewise, when dealing with clients, the first steps are often the most important, and meeting initial deadlines helps to build a solid rapport with the client. (In fact, I’ve heard some freelancers mention that it is often better to slightly overestimate the time required to finish a task, so that when they finish early, their clients beam and boast of their accomplishments – as well as pass along high recommendations. After all, it’s much better to have a little extra time on our side than be squeezing everything in up to the deadline).